Jacques Ellul’s classic book on the Christian’s role in a technologically mediated society just got a fresh translation, the first in over 50 years. And let me just say, the new cover is so cute, so modern. It hits the hipster aesthetic nail on its bearded, ray-bans wearing head. This book will look great on your coffee table or bookshelf as it wrecks your preconceptions about the Christian’s relationship to the state and technological media. If you’ve been looking for something to place next to all your Noam Chomsky books, to let people know you have a nuanced perspective on propaganda and media studies, then here’s your sign. First translated into English by Olive Wyon in 1951, Ellul’s Présence au monde moderne: Problèmes de la civilisation post-chrètienne is the cornerstone of his theoretical work. As a sociologist and lay theologian, Ellul sought to make concrete sense out of the common Christian concept “be in the world, but not of it.” In the process, he produced an incredible theory of propaganda and a collection of foundational essays and books on media and society that have merited him a position as one of the founding fathers of media ecology. Although his thought can be difficult, scholars both secular and sacred agree that it is well worth studying. Olive Wyon’s original translation presented the title as “The Presence of the Kingdom,” and was freer in its interpretation of the text. 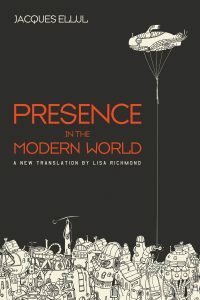 Lisa Richmond, however, has rendered a new translation with gender neutral language (thank the Lord!) and a little less interpretive work on her part. Her translation lets the reader do the interpreting, leaving distinctly French phrases and points of view in tact. “Presence in the Modern World” is going to be a must read for anyone interested in media ecology or even just Ellul himself.